New York-based psychedelic rock outfit MGMT are at the core a duo comprised of Andrew VanWyngarden and Ben Goldwasser. But live, they are one of those bands that are expansive. And by all indications of reviews from their current global invasion in Europe, that axiom is reinforced nightly with the touring six-piece outfit, bring music from their current, self-titled release to the masses. 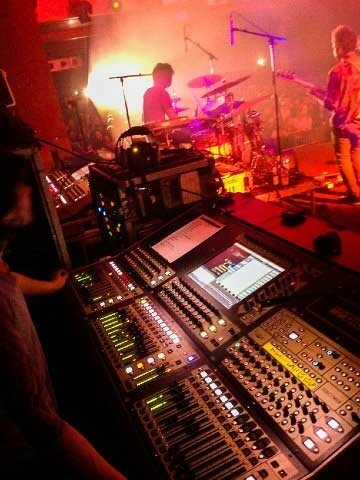 Behind the controls at monitor world for the past seven months has been Fabian Quiroga, back on his favourite DiGiCo SD8 desk since his departure earlier in the year from a lengthy stint with The Black Keys. The SD8 was provided by Eighth Day Sound’s UK shop. For this run, MGMT’s Andrew handles vocals in addition to guitar, keyboards, and even a huge 70lb cowbell! Other frontman Ben does double duty on keys, plus some additional samplers and effects units. Both are complimented by guitar, bass, drums, and another player on guitar and keys – all of which sing, with the exception of the bassist. “I believe we have a total of 46 inputs,” he sums, “not including my stage talkbacks.